INTERESTED IN THE INTERNATIONAL TENORS? 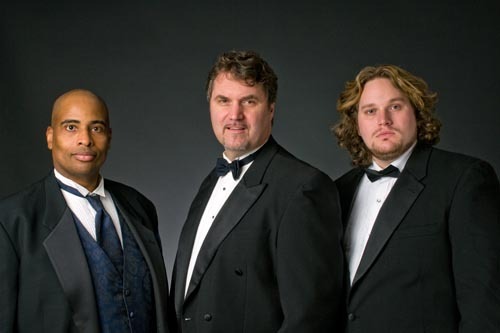 The International Tenors bring you everything you could hope to hear in a three tenor concert: Opera, Musical Theater, Operetta and Pop ... performed as only true tenors can, with authenticity and a little humor! An incredible show coupled with a multimedia video. The tenors perform on stage with a big screen showing scenes and footage of Italy, Spain, and France… and of your favorite artists. The audience will almost believe they are sitting in a little café watching a great show in the Piazza…. a wonderful little getaway! The show includes a stirring tribute to the famous tenors of the past: Enrico Caruso, the world's first tenor superstar… Mario Lanza, Hollywood's biggest star in the 1950s and the world's first true crossover tenor… and of course, Luciano Pavarotti, dubbed the voice of the century. They then perform an animated and fun-loving set of the most beloved three tenor songs and arias! “O Sole Mio,” “La Donna Mobile” and the drinking song “Libiamo”… plus a medley of your favorite musical theater numbers, from shows such as The Phantom of the Opera, West Side Story and Les Miserables. The International Tenors then switch gears and perform some of the world’s greatest Pop/Opera hits! "Time to Say Goodbye" and "the Prayer" by the world’s biggest selling opera singer, Andrea Bocelli; “You Raise Me Up" by Josh Groban; song selections from Il Divo and others. They then bring the show to a powerful conclusion with the song that made Pavarotti a household name… “Nessun Dorma”!